A New Black Widow #1 from an Eisner-winning Team! Chris Samnee is one of my favorite artists, doing work that feels classic and clean while having a modern flair. His comics feel like COMICS, what got some of us into the medium in the first place. And Mark Waid? Simply one of the best writers in the business. I don’t think I’ve ever read a bad story by Waid. Though right now, I suspect that Marvel could put anybody on Black Widow and the book would sell — the interest is VERY high in the character — this is an excellent choice. I won’t call it “all new all different” – this is just what Marvel should be — all good. All-New, All-Different Marvel charges forward with the most popular characters in the world brought to life by red-hot creators! Today, Marvel is pleased to announce BLACK WIDOW #1, the new ongoing series from the Eisner Award winning creative team behind Daredevil! Writer Mark Waid, artist Chris Samnee, colorist Matt Wilson and letterer Joe Caramagna re-unite for a new take on the Marvel Universe’s greatest super spy! Natasha has spent years gathering secrets. Knowledge and intel on friends and enemies alike. But when some of those dark secrets begin mysteriously going public, no one is safe. Now, Natasha has become the one thing she never thought she’d be – S.H.I.E.L.D.’S MOST WANTED! Betrayed by her former accomplices, with friend and foe alike nipping at her heels, all bets are off. With a lifetime of training and ingenuity at her disposal, she’s out for answers, and she’s going to get them any way she can. It’s a knock-down, drag-out tale of action, adventure and espionage! All eyes are on the Black Widow. With enemies closing in at every side, it’s time to show everyone why she is and always will be the world’s greatest spy. 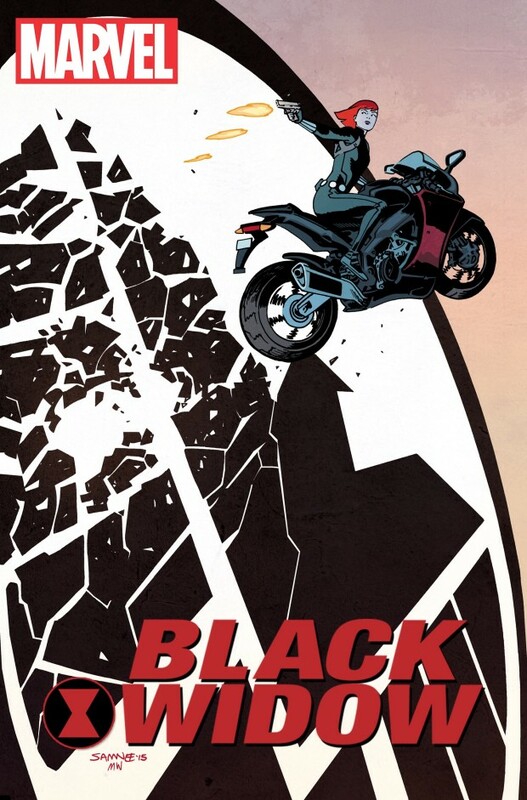 The chase is on when BLACK WIDOW #1 explodes on to the scene early next year!